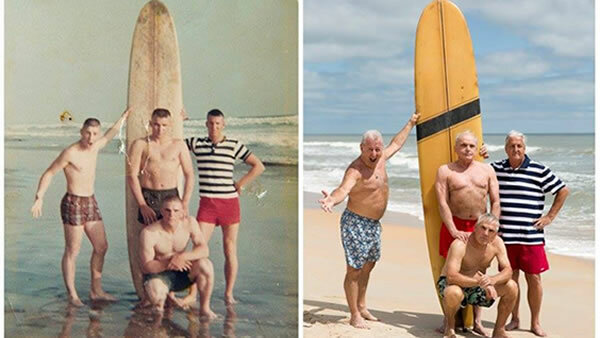 Four U.S. Marines gathered around a yellow longboard last weekend to recreate a moment from five decades earlier. They wanted the picture to be as close as possible to one taken together 50 years ago. In 1966, the four U.S. Marines were stationed together in Camp Pendleton, outside San Diego, as the Vietnam War was ramping up. They were part of a weapons platoon and ended up separating once they arrived in Vietnam. Two of them earned Purple Hearts. They group reunited after one of them stumbled across an online memorial for a fallen comrade they all knew, and that started a chain of events that put the four back in touch, according to WFAA. None of them can remember the exact date the photo was taken, but they can all agree that the snap captured a memorable time for the young men. For more stories about veterans, click here.